If you have been on Instagram in the last year or so, you know what an avocado toast is. Ranging from a breakfast staple or a gorgeous appetizer, it gives any chef a chance to be creative. 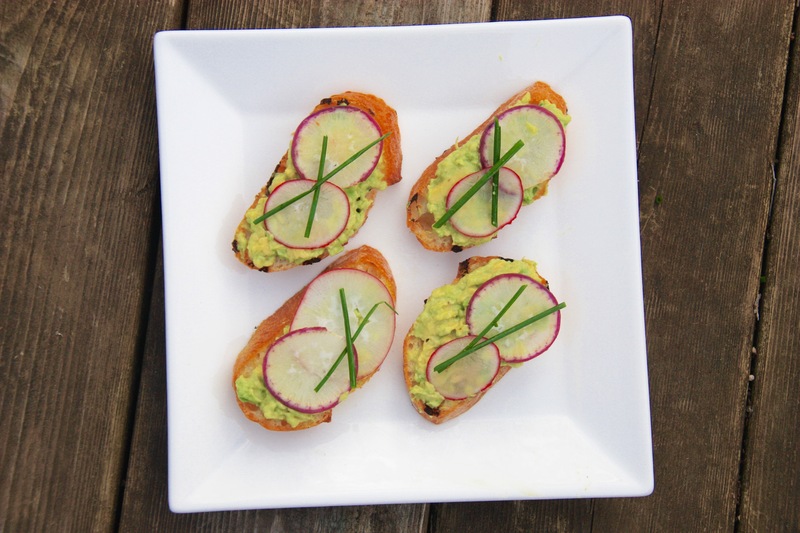 With springs arrival, I used gorgeous chives and easter egg radishes as my garnish to give my toast a girlish vibe. The toasts get extra aroma and flavour from the garlic oil used in the mixture and as a topper for the toasts before they are grilled. For the garlic oil, in a small pot add all of the ingredients over medium heat. Bring the oil to a simmer, and cook until the garlic has turned golden, about 10 minutes. Strain the oil through a sieve into a bottle or jar, ready for drizzling. For the avocado spread, combine the avocado, garlic, garlic oil and squeeze in the lemon juice, discarding any seeds. Season with a pinch of salt and pepper. On both sides of each baguette slice, brush a touch of the garlic oil. Grill the baguette on both sides until grill marks appear and the bread becomes golden and toasty. Spread the avocado mixture on one side of the baguette. Top with a couple radishes and garnish with chives. Serve and enjoy! Garlic oil can be used for anything! Pastas, roasted veggies or even just a fancy dip (you can't go wrong).